My riding mower is a beast among lawnmowers. It is a gas guzzling mechanical animal of the highest order. All the other home owners in my neighborhood are envious of me all summer long. It has much more power that would never be necessary for a suburban lawn, however that is what gives it its awesome reputation. It is really a small tractor and could if necessary do much larger jobs like pulling a trailer. It even has the capability for a snow plow and grader attachments. It has a wide 48" mower deck cutting a wide swath making my relatively large yard seem small. I get done in about half the time of the other guys in the neighborhood. It is a model from the 1980's but still cranks and runs quiet and smooth. 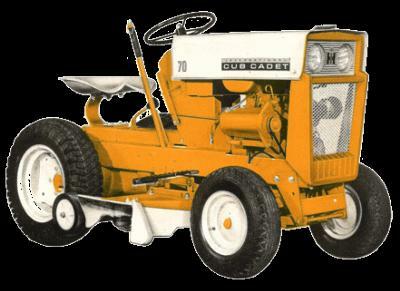 It is like the Mercedes-Benz of lawn mowers. It is the Michael Jordan of lawn care. It is a Picasso of lawn mowers. The only problem is that on a rare occasion when something needs to be fixed, it costs a small fortune to repair. It is big and heavy and a pain to get to the repair shop. One time I had to have the hydrostatic gear repaired and it cost about $600.00. With that I could have gone out and bought a mower like all the others on my street, but that would put me in the same pathetic league with them, and we could not have that, now could we?